Vijayapura District Court Result 2019: Below are the latest results published by Vijayapura District Court - Vijayapura District Court, Karnataka / districts.ecourts.gov.in. The recent result announced by the organization is Process Server Result 2019. 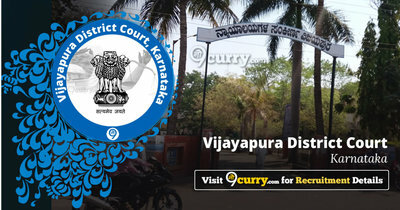 Vijayapura District Court Process Server Result 2019: Vijayapura District Court, Karnataka has announced the Result on 11 Apr 2019 for Vijayapura District Court Process Server Exam 2019 . Vijayapura District Court Typist Interview Marks 2019: Vijayapura District Court, Karnataka has announced the Result on 10 Apr 2019 for Vijayapura District Typist Court Exam 2019 . Vijayapura District Court Peon Interview Marks 2019: Vijayapura District Court, Karnataka has announced the Result on 09 Apr 2019 for Vijayapura District Court Peon Exam 209 . Vijayapura District Court Typist Result 2019: Vijayapura District Court, Karnataka has announced the Result on 13 Mar 2019 for Typist Test 2019 . Vijayapura District Court Typist-Copyist Result 2019: Vijayapura District Court, Karnataka has announced the Result on 13 Mar 2019 for Typist-Copyist Test 2019 . Vijayapura District Court Typist Marks 2019: Vijayapura District Court, Karnataka has announced the Result on 06 Mar 2019 for Vijayapura District Court Typist Exam 2019 which was conducted on 09 Feb 2019 to 11 Feb 2019. Vijayapura District Court Stenographer Result 2019: Vijayapura District Court, Karnataka has announced the Result on 14 Feb 2019 for the exam . Vijayapura District Court Typist Result 2019: Vijayapura District Court, Karnataka has announced the Result on 14 Feb 2019 for the exam .